"Paint Cart 5000 vs. The Mondo Spider"
It’s certainly not like this week’s news that Fox was shelving Enlisted for the foreseeable future is a surprise to anyone who’s been paying attention. The ratings are terrible, even with the increasingly low standards by which that network is judging its sitcoms—last week’s episode drew 1.36 million viewers and an 0.5 in the key demo, which is a figure that makes NBC comedies look like CBS comedies in comparison. You can say anything you want to about the meaninglessness of ratings in this day and age, but they’re still the benchmark that networks use to conduct business, and by the end of the day they didn’t present a quantifiable reason to keep Enlisted on the air. There’s some silver lining in that Fox has assured viewers we’ll get to see the remaining four episodes at some point in the future, but given I’m still waiting to see unaired episodes of Ben And Kate I won’t be holding my breath. The reason why it rankles is because this is a fate that came upon Enlisted through no fault of its own, as the show was increasingly subjected to a series of bad decisions by the network. Held for midseason? Fine. Held for midseason and dropped on Fridays with the on-its-last-legs Raising Hope? Fair enough. Held for midseason, dropped on Fridays and airing episodes out of order? Now it seems like the network just hates you. But then they unleash the combo of held for midseason, dropped on Fridays, airing episodes out of order, losing Bones as a lead-in, and pushed aside for the Olympics, and now you may as well picture the show as sitting on top of a dunk tank chair about to drop into a pool of acid full of piranhas who can breathe said acid. America’s still to blame for not watching the show, but Fox earns the lion’s share of blame for not giving it a window where more people could watch it. Sigh. Okay, needed to get that bitterness out of the way. Let’s talk “Paint Cart 5000 vs. The Mondo Spider,” which if nothing else is a clear contender for best episode title of the year. If this must be our last go-around with the soldiers of Fort McGee, it’s a good one to close out on. The premise is more out there than previous episodes and the action is more on the comedic side of things than the emotional side, but it makes a nice palate cleanser after the emotional apex of last week. The titular vehicles in question are the latest advancements to come to Rear Detachment. The Paint Cart 5000 is Pete’s own invention, a tricked-out golf cart for wall-painting that’s much better in theory than execution. It’s beloved by the troops but almost immediately eclipsed by the Mondo Spider, a lithium-ion contraption striding right out of Wild Wild West. Randy in particular is gripped with childlike enthusiasm, recalling his first crush as Rosie the Robot from The Jetsons and his first book from the library Charlotte’s Web. (Which he now realizes he never returned.) If “Vets” showed us how powerful Enlisted can be with military reality, “PC 5k vs. TMS” shows us the perks of being able to step outside that reality once in a while, letting our heroes play with some cutting-edge machines. However, control of this machine lies in the hands of an officer who Pete’s already managed to get on the bad side of, Second Lieutenant Tyson Schneeberger (played by Ross Phillips of Hart Of Dixie). In keeping with the Stripes/National Lampoon vibe of Enlisted, Schneeberger looks like he’d be right at home amongst the brothers of Omega Theta Pi, an officious sort who orders craft beers at the unpretentious Claymore and speaks loftily of his squash career. Fortunately for Pete he’s learned a thing or two about commanding officers since punching out a colonel cost him his super soldier status, and he opts for a passive-aggressive approach of replacing “sir” with “syrup” every time he addresses him. Such comments don’t go unnoticed by Schneeberger however, and he denies the assignment. It’s the effort of the unit to get the assignment back where the episode falls a little flat. While previous episodes have focused on the growing bond between Pete and his unit, “PC 5k vs. TMS” throws that out as the entire unit is enraptured by the machine and is willing to throw him under the bus if it means access to the Spider. There’s some great comedic moments as Randy’s efforts as group spokesman go to war with his innate desire to praise his oldest brother, but both the apology scene to Schneeberger and the subsequent lobster dinner leave Pete marginalized to an unfair degree. As a sign of how cool the Mondo Spider project is, even Derrick’s willing to overcome his general desire to avoid participation in anything. Unfortunately (and ironically) the one time Derrick wants to get involved he’s unable to, as Cody calls him away to help him shoot his new official portrait. The longer Enlisted’s been on the air the more clearly it makes the argument that Keith David is a comedic treasure, and he’s in fine form here as Cody cycles through a variety of props and facial expressions in an attempt to capture his “inner essence.” It’s a gleefulness that only grows in hilarity with the increased frustrations on Derrick’s face, frustration that pushes him to the breaking point. Cody’s ostensibly presented as the father figure to the Hill brothers, but with his recent track record—making them shepherd the vets around on their day off, flaunting his clear favoritism of Jill, and now this—the increasing perception of this relationship is that he just likes picking on them. That is until Derrick finally gets the opportunity to blow up at Cody for wasting his time, and Cody turns around and hits him with the real reason for this project: he wanted Derrick to show enthusiasm for anything. While Pete’s journey is ostensibly the central story of Enlisted, over the course of the season there’s something even more compelling about watching Derrick’s evolution, the everyman quality of his directionless life gradually finding direction thanks to his brothers and his relationship with Erin. (Continuity problems with the latter aside.) I’m not entirely sold on the idea of him becoming a photojournalist as this is the first time that character detail’s come up—even though as holder of a journalism degree I’ll nod assent to Cody’s “know-it-all smartass” designation for the profession—but I appreciate the investment in his character on a professional level as well as personal. Plus, the neutrality of such a position means that he can stand apart from the chaos that soon takes over the rest of the platoon. Turns out the military hierarchy of Enlisted isn’t just looking to the films of Jon Peters for military inspiration, it’s also been reading the work of Warren Ellis and decided to develop its own bowel disruptor—or in layman’s terms, a poo gun. Schneeberger reveals his true colors and they turn out to be brown, as he only sees the platoon as lobster-packed target practice. Here things get clever, with throwaway gags in the first act forming keys to the third: Jill’s skill at semaphore gets a warning to the rest of the troops in time, and it’s Randy’s utter inability to drive a golf cart normally that lets Pete devise a plan of attack. Something that Enlisted hasn’t been given enough credit for is the way it’s able to create epic moments in the midst of screwball antics, such as the war games of the pilot and the Marine-Army football game. 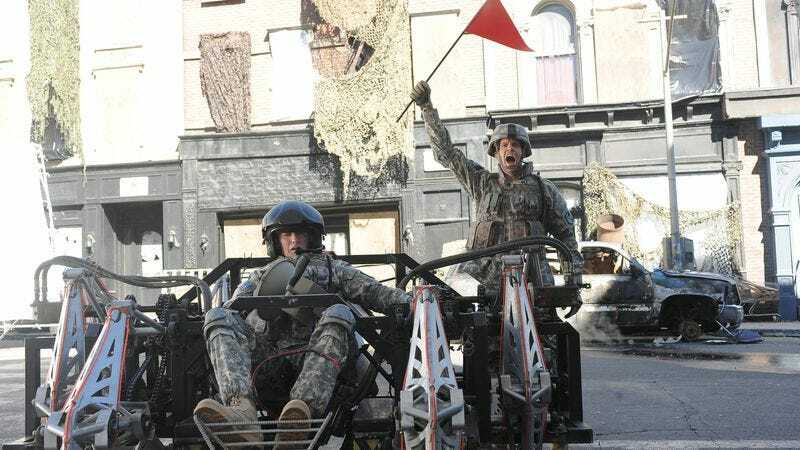 The final battle between the Paint Cart and the Mondo Spider, for all the silliness of both devices, is played with a surprising amount of earnestness: Troops falling off the former in slow-motion as if they were actually shot down, bellowing cries of pain and exhortations of bravery, and the triumph as Pete makes his way over and turns the weapon on his foe. It’s a legitimately exciting scene, and any serious side is defused by Pete looking around to see everyone else voiding the contents of their bowels. It’s nice that the unit gets to end on a victory, because it certainly doesn’t feel like one for the viewers. Enlisted is a show that’s consistently good, frequently very good, and at times even great; a comedy with an ensemble who cohered in record time and that has a clear mission in its head to go along with the wacky jokes. To lose it for the foreseeable future and to see the renewal hopes dwindle to next to nothing is a pity, because a show that’s able to bounce from seriousness to weirdness as well as this one can doesn’t come along every season. Here’s hoping someone at Fox recognizes the raw deal they gave it and has the good sense to extend a lifeline. Not a lot for Angelique Cabral to do this episode, but I do enjoy that Jill knows semaphore and gets a huge smile on her face while performing it. MVP award for best ensemble player this episode goes to JaMort, who had so many great lines between his running gag with Ruiz (“So this is the stuff white people get excited about.” “This gets me excited!”), his sand art and subsequent song about creating sand art, and his reaction to the reality of the poo gun (“It’s real! Oh god, the images!”). Pete brings a Hop-topus Eight-Legged Ale as a peace offering to Schneeberger. Glad to see he resisted the urge to continue prodding the other man and didn’t gift one of Rodney’s Summer Pig Roast Ales. And now my leave begins. I salute all Enlisted commenters for tuning in on a weekly basis and sharing my affection for this wonderful little show, and I hope to report back for duty in the near future.